Orange was originally incorporated as a township by an act of the New Jersey Legislature on November 27, 1806, from portions of Newark Township. Portions of the township were taken on April 14, 1834, to form the now-defunct Clinton Township. On January 31, 1860, Orange was reincorporated as a town. Portions of the town were taken to form South Orange Township (April 1, 1861, now known as Maplewood), Fairmount (March 11, 1862, now part of West Orange), East Orange Township (March 4, 1863) and West Orange Township (April 10, 1863). On April 3, 1872, Orange was reincorporated as a city. In 1982, the city was one of four Essex County municipalities to pass a referendum to become a township, joining 11 municipalities that had already made the change, of what would ultimately be more than a dozen Essex County municipalities to reclassify themselves as townships in order take advantage of federal revenue sharing policies that allocated townships a greater share of government aid to municipalities on a per capita basis. The city derives its name from William III of England or William IV, Prince of Orange. Orange is often joined with neighboring East Orange, South Orange and West Orange and referred to as part of "the Oranges". Orange had its origins in Connecticut's New Haven Colony. In 1666, a group of 30 of New Haven's families traveled by water to found "a town on the Passayak" River. They arrived on territory now encompassing Newark, the Oranges, and several other municipalities. The area was situated in the northeast portion of a land grant conveyed by King Charles II of England to his brother James, Duke of York. In 1664, James conveyed the land to two proprietors, Lord John Berkeley and Sir George Carteret. Since Carteret had been Royal Governor of the Isle of Jersey, the territory became known as "New Jersey." 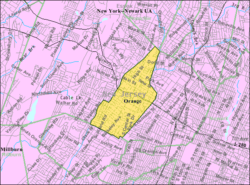 Orange was initially a part of the city of Newark, but it was originally known as "Newark Mountains". On June 7, 1780, the townspeople of Newark Mountains officially voted to adopt the name Orange. At the time, there was a significant number of people in favor of secession from Newark. However, this would not occur until November 27, 1806, when the territory now encompassing all of the Oranges was finally detached. On April 13, 1807, the first government was elected, but not until March 13, 1860 was Orange officially incorporated as a city. Immediately, the new city began fragmenting into smaller communities, primarily because of local disputes about the costs of establishing paid police, fire, and street departments. South Orange was organized on January 26, 1861; Fairmount (later to become part of West Orange) on March 11, 1862; East Orange on March 4, 1863; and West Orange (including Fairmount) on March 14, 1863. Orange is located on the Newark and Mount-Pleasant Turnpike, the main road from Newark to Morristown, and ultimately to Easton, Pennsylvania. The town became a busy thoroughfare for travelers, and hotels abounded. Initially, the stagecoach was the primary method of transportation. Omnibuses of the Eclipse and the Morris & Newark Lines serviced Orange. The Morris and Essex Railroad arrived in Orange in November 1836, its first cars drawn by horses. On October 2, 1837, the first steam locomotive appeared, and the horses were, with minor exception, relegated to pasture. The "M&E" later became a part of the Delaware, Lackawanna and Western Railroad (DL&W), which exists today as NJ Transit's Morristown Line. Trolley cars appeared much later, with the Orange and Newark Horse Car Railroad Company running its first car up Main Street in May 1862. The Orange Crosstown Line, eventually extending from Morris Street, Orange, to Bloomfield, was started in June 1888. (The first electric trolley in the State of New Jersey operated over a section of this line.) Eventually, all of the trolleys, and the buses that replaced them, became part of the sprawling Public Service Coordinated Transport System. Orange was an industrial city from the outset. Early settlers found a profuse growth of hemlock trees, an ideal supply of tannic acid for the tanning industry, and boot and shoemaking factories soon flourished. F. Berg & Co. hat factory building, built in 1907. The company left in the 1920s. Orange was once the hatmaking capital of the United States. The industry can be traced there to 1792. By 1892, 21 firms were engaged in that trade, employing over 3,700 people in plants that produced about 4.8 million hats, which had a combined value in excess of $1 million. Several brothers founded the "No-Name Hat Company" in Orange before one of them moved on to make fedoras in Philadelphia under the family name, "Stetson." 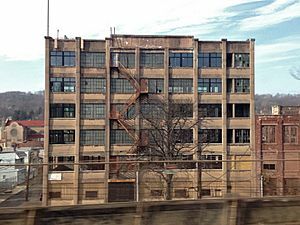 By 1921, however, only five hatmaking firms were left, many having departed for places such as Norwalk and Danbury, Connecticut. By 1960, all had left. Beer was a major revenue producer in Orange beginning in the early 1900s, when the three Winter Brothers of Pittsburgh, Pennsylvania, arrived in the city and built the first brewery. The Orange Brewery was constructed in 1901 at a reported cost of $350,000. The production of beer ceased with prohibition in 1920, and after the repeal of the Volstead Act in 1933, the brewery was sold to John F. Trommers of Philadelphia. Trommers brewed beer under that label until 1950, when the concern was again sold to Liebmann Breweries, Incorporated, which bottled Rheingold Beer. Eventually, after several additional owners, the plant was closed permanently in 1977. Other notable firms located in Orange were the Monroe Calculating Company, manufacturers of the patented adding machines of the same name, and the Bates Manufacturing Company, producers of office accessories such as staplers and stampers. The United States Radium Corporation was a notorious resident of Orange. This firm refined ore and extracted the radium used to make luminous paint for dials and hands of watches and other indicators. It was only years later that the terrible carcinogenic effects of this material became known, and the polluted site of the factory became a thorn in the side of the city. Orange has produced such notables as baseball's Monte Irvin and heavyweight boxer Tony Galento. Actor William Bendix lived and worked here for a short while. Presidents, presidential candidates, and governors visited. Orange threw a grand party on its 100th anniversary, and another when it turned 150. Once a multi-ethnic, economically diverse city, Orange suffered indirectly from the 1967 riots in Newark (even though Newark and Orange do not share a border) and directly from the construction of Interstate 280 through the heart of the downtown area, triggering middle-class "white flight" from aging industrial towns to the new automobile suburbs being built in western Essex County and elsewhere. By the end of the 1970s, Orange had many of the urban ills normally associated with larger cities. In 1982, citizens voted overwhelmingly to change the designation of Orange from a city to a township, thereby making it eligible for federal Revenue Sharing funds. In 1985, the State of New Jersey named Orange as a State Urban Enterprise Zone, creating tax breaks and investment incentives. This program has since been phased out. According to the United States Census Bureau, the township had a total area of 2.201 square miles (5.700 km2), including 2.199 square miles (5.694 km2) of land and 0.002 square miles (0.005 km2) of water (0.09%). The East Branch of the Rahway River travels through Orange. As of the census of 2010, there were 30,134 people, 11,202 households, and 6,878 families residing in the township. The population density was 13,705.7 per square mile (5,291.8/km2). There were 12,222 housing units at an average density of 5,558.9 per square mile (2,146.3/km2)*. The racial makeup of the township was 12.80% (3,857) White, 71.83% (21,645) Black or African American, 0.57% (173) Native American, 1.51% (455) Asian, 0.02% (6) Pacific Islander, 9.95% (2,999) from other races, and 3.32% (999) from two or more races. [[Hispanic (U.S. Census)|Hispanic or Latino of any race were 21.67% (6,531) of the population. There were 11,202 households out of which 31.0% had children under the age of 18 living with them, 28.6% were married couples living together, 24.6% had a female householder with no husband present, and 38.6% were non-families. 32.7% of all households were made up of individuals, and 11.4% had someone living alone who was 65 years of age or older. The average household size was 2.66 and the average family size was 3.38. In the township, the population was spread out with 25.0% under the age of 18, 9.8% from 18 to 24, 30.5% from 25 to 44, 23.6% from 45 to 64, and 11.2% who were 65 years of age or older. The median age was 34.4 years. For every 100 females there were 89.0 males. For every 100 females ages 18 and old there were 84.1 males. The Census Bureau's 2006-2010 American Community Survey showed that (in 2010 inflation-adjusted dollars) median household income was $40,818 (with a margin of error of +/- $1,616) and the median family income was $44,645 (+/- $4,033). Males had a median income of $34,986 (+/- $3,168) versus $36,210 (+/- $2,706) for females. The per capita income for the borough was $19,816 (+/- $1,027). About 16.2% of families and 18.1% of the population were below the poverty line, including 24.6% of those under age 18 and 20.6% of those age 65 or over. As of the 2000 United States Census there were 32,868 people, 11,885 households, and 7,642 families residing in the township. The population density was 14,903.7 people per square mile (5,742.3/km2). There were 12,665 housing units at an average density of 5,742.8 per square mile (2,212.7/km2). The racial makeup of the township was 13.20% White, 75.10% Black or African American, 0.34% Native American, 1.26% Asian, 0.10% Pacific Islander, 5.21% from other races, and 4.79% from two or more races. Hispanic or Latino of any race were 12.47% of the population. There were 11,885 households out of which 33.4% had children under the age of 18 living with them, 30.7% were married couples living together, 26.3% had a female householder with no husband present, and 35.7% were non-families. 30.2% of all households were made up of individuals and 10.5% had someone living alone who was 65 years of age or older. The average household size was 2.73 and the average family size was 3.38. In the township the population was spread out with 27.7% under the age of 18, 10.0% from 18 to 24, 32.2% from 25 to 44, 19.3% from 45 to 64, and 10.8% who were 65 years of age or older. The median age was 32 years. For every 100 females there were 86.0 males. For every 100 females age 18 and over, there were 79.1 males. The median income for a household in the township was $35,759, and the median income for a family was $40,852. Males had a median income of $33,442 versus $29,520 for females. The per capita income for the CDP was $16,861. About 15.4% of families and 18.8% of the population were below the poverty line, including 24.6% of those under age 18 and 16.7% of those age 65 or over. As part of the 2000 Census, 75.10% of Orange's residents identified themselves as being African American, one of the highest percentages of African American people in the United States, and the fourth-highest in New Jersey (behind Lawnside at 93.60%, East Orange at 89.46%, and Irvington at 81.66%) of all places with 1,000 or more residents identifying their ancestry. Orange has a large Haitian American population, with 11.4% of residents identifying themselves as being of Haitian ancestry, the highest of any municipality in New Jersey and the eighth-highest in the United States. Although still a small percentage of total residents, Orange and East Orange have the largest concentrations of Guyanese Americans in the country. In the 2000 Census, 2.9% of Orange residents identified as being of Guyanese ancestry. While Queens and Brooklyn had larger populations in terms of raw numbers, Orange and East Orange (with 2.5%) had the highest percentages of people of Guyanese ancestry as a portion of the total population of all places in the United States. As of May 2010[update], the city had a total of 44.64 miles (71.84 km) of roadways, of which 39.14 miles (62.99 km) were maintained by the municipality, 4.43 miles (7.13 km) by Essex County and 1.07 miles (1.72 km) by the New Jersey Department of Transportation. The Orange and Highland Avenue stations provide NJ Transit train service along the Morris & Essex Lines (formerly Erie Lackawanna Railway). Service is available via the Kearny Connection to Secaucus Junction and Penn Station in Midtown Manhattan and to Hoboken Terminal. Passengers can transfer at Newark Broad Street or Summit station to reach the other destination if necessary. NJ Transit buses in Orange include the 21, 24, 34, 41, 44, 71, 73 and 79 routes providing service to Newark and local service on the 92 and 97 routes. 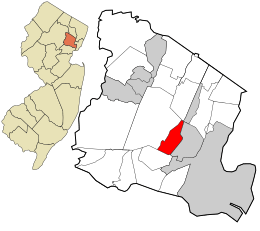 Orange, New Jersey Facts for Kids. Kiddle Encyclopedia.